T12 North at University College Hospital is the Teenage Cancer Trust Unit. It was developed due to the commitment of The Teenage Cancer Trust to bring teenagers with cancer together so they receive the very highest standards of care alongside other young people. This ensures opportunities for peer support are maximized and young people can share their cancer experience with other people their own age and reduce fear and isolation. We are committed to providing the very highest standards of care delivered by specialist nursing, medical care and members of the wider multidisciplinary team that includes occupational therapy, physiotherapy, social work, complementary therapy, psychological support and activity coordinators. Our Unit takes young people from 13 years - 20 years and we work closely with our paediatric and adult colleagues. Our ward has 18-beds and we try really hard to ensure everyone's stay in hospital is as comfortable as possible. We have a mixture of side rooms and two five bedded bays. Though the idea of a bay may seem a little daunting as you might be used to having your own room some young people really prefer being in the bays as it allows you to spend time with other young people, share experiences, tease the nurses and support one another. 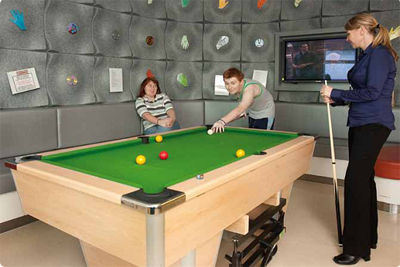 Facilities include a plasma TV in each room, TV by the bedside, internet access, a webcam so patients can stay in touch with friends and family at home, and a social area where young people can spend time with each other. We understand how important it is to have your mum or dad with you so one parent or carer over 18 years is allowed to stay with you when you are in hospital. We welcome visitors and know how important it is for you to see your friends and family. We have a kitchen where you or your carer can prepare snacks or use the vending machine funded by Tesco's when you feel hungry and this is free. In April 2012 the UCH Macmillan Cancer Centre opened providing outpatient clinics and ambulatory care for teenagers and young adults on the 3rd floor. 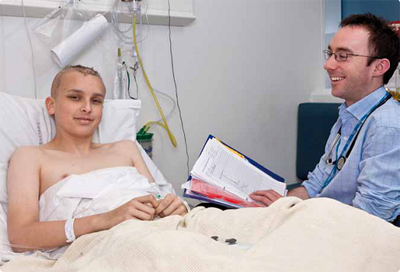 Ambulatory Care provides the opportunity for young people to receive a variety of treatments including chemotherapy without having to stay in hospital overnight. This exciting development is supported by CLIC Sargent due to the opening of 'Paul's House' - a home-from-home for our patients and their families. Instead of staying in hospital, some young people will have the opportunity to stay with a family member in Paul's House and come to hospital to see their doctors, nurses and other important health professionals before having their treatment each day. The 3rd floor of the Cancer Centre complements the existing Teenage Cancer Trust inpatient unit at UCH. Known as the Teenage Cancer Trust Hub, the unit provides outpatient care, treatment and consultation for young people with cancer aged from 13 to 24. Featuring the very best in interior design and technology, The Hub consists of treatment pods, consulting rooms, private treatment rooms and a recreation area. Designed and based on the ideas of young people, The Hub also includes a gym, DJ booth, computer gaming space, education zone, family area and cafe. Being a teenager can be a difficult time without the added difficulty of receiving treatment for your illness. That is why specialist Teenage Units have developed all over the country with the support of the Teenage Cancer Trust. At UCH we have a large multidisciplinary team (MDT) who want to provide help and support you to try and make this time a little easier. Our experienced consultants within adolescent haematology and oncology lead on clinical treatment. Our team of sarcoma specialists are Prof Jeremy Whelan, Dr Sandra Strauss, Dr Beatrice Seddon, Dr Palma Dileo and Dr Maria Michelagnoli. The nursing team is committed to providing the very highest standard of cancer nursing care whilst recognising the unique needs of young people. We also have Clinical Nurse Specialists / Key Workers who meet all young people who come to UCH and will provide advice, support information and act as a link between UCLH and your local hospital, community team and your school. We understand that your illness and treatment can affect your education, so we work with the hospital school based at Great Ormond Street Hospital to coordinate study with your school, and we will facilitate introduction of home tuition and do school visits with your key worker if you feel you would like one. Even sitting exams is not a problem if you need to be in hospital as will we ensure exam papers are sent to UCLH and support you to complete them. We know your illness and treatment may affect you physically and interfere with your mobility and independence, so you can meet a physiotherapist who will help design an individualised training programme, self-directed and/or supervised, to help your mobility when needed. Chemotherapy and medicines play an important role in the treatment of most of the illnesses on T12 North so our pharmacist visits the ward on a daily basis to ensure that the chemotherapy is prescribed and answer any questions about your medicines. When you go home you will be given your own medicines for home. Our occupational therapist will meet you if you want help with any physical challenges as a result of your illness and treatment or if your want advice and support about relaxation or fatigue management. Our activity coordinators are trained play specialists and hope to help you cope better with being in hospital by offering you choice and control, through activities and support. They will also help prepare you for treatment and procedures and help with anxiety management through relaxation. Lizzie Burns who runs the Art of Life project also regularly visits the unit. We also have a well-equipped activity room that you can spend time in with other young people or your friends. Eating and drinking can be hard when you are on treatment so we have a dietician to help you and your family. They can help you look after your diet, offer advice and tips to keep you healthy. The UCLH Complementary Therapy Team offers a range of treatments to young people and parents within the unit, including aromatherapy, reflexology and reiki. Benefits reported by patients include pain reduction, relaxation, increased energy and a reduction in the side effects felt from other aspects of treatment. Patients also have access to the Macmillan Support and Information Service at the UCH Macmillan Cancer Centre , which provides access to a wide range of complementary therapies. The CLIC Sargent Social Care Team at UCLH provides a specialist social work service for young people aged 24 and under with cancer, and their families. They act as a professional liaison service, supporting communication between the patient's family and the medical and nursing staff involved in a patient's care both at UCLH and externally. As part of this, the team provides financial advice and assistance including support around applying for welfare state benefits and access to CLIC Sargent care grants. The team also provides support around accessing housing, employment, disability services, local social care services in the community and bereavement services. The CLIC Sargent Team can also provids free holidays and free 'Home from Home' accommodation for patients and families at Paul's House, which is situated close to the University College Hospital. A diagnosis of cancer can be devastating and brings unique challenges for both the young person with cancer and their relatives. An integral part of our service is the Family Support Network that is hosted at UCLH and funded by Teenage Cancer Trust. Historically patients and relatives have identified as highly valuable the support and benefits from being in an environment where they have contact with other young people and relatives going through a similar journey. However, at times such as the end of treatment, access to support may decrease. To bridge this perceived gap The Family Support Network was established as a nurse-led initiative. The network aims to support young people with cancer aged between 13 and 24 years, and their families, throughout their treatment, but focusing on support at the end of treatment. We also believe the needs of the whole family have to be recognised to better support children and young people. Every month we hold an all-day social support day in London. This provides the opportunity for patients and their families to share experiences and gain support from one another, with support and facilitation from health care professionals.